Substantivkomposita und kulturelles Sinngebungspotenzial in frühmittelalterlichen Schultexten Notkers III. In diesem Beitrag gehe ich der Frage nach, wie Substantivkomposita als sprachliches Mittel im Rahmen der frühmittelalterlichen Wissensvermittlung am kulturellen Sinngebungsprozess teilhaben. Kulturelle Signifikanz äußert sich in Mustern des Sprachgebrauchs und hier sollen solche Muster im Gebrauch von Substantivkomposita in den althochdeutschen Bearbeitungen lateinischer Schultexte Notkers III. von St. Gallen aufgedeckt werden. 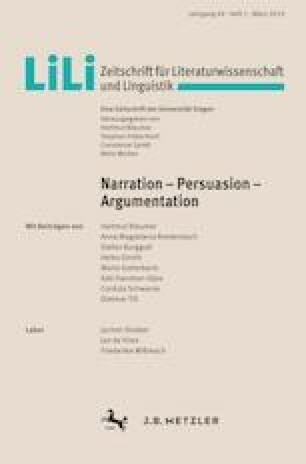 Methodologisch wurde für die Analyse der Komposita ein morphosemantischer Ansatz mit einem hermeneutischen Ansatz, der die Komposita in ihrem textuellen und kulturellen Ko- und Kontext interpretiert, vereint. Hierbei wurden zwei signifikante Muster beobachtet: Das Muster der erklärenden Übersetzung, bei denen die Komposita als komplexe sprachliche Einheiten ein Mehr an Information gegenüber der Übersetzungsvorlage liefern und das Muster der zusammenfassenden Übersetzung, bei dem drei- oder mehrgliedrige Strukturen des Ausgangstextes in einem binären Kompositum zusammengefasst werden. In this article, I approach the question of how nominal compounds contribute to the construction of cultural meaning within the framework of early medieval knowledge transfer. Cultural significance manifests itself in patterns of language use and the central objective of this study is to reveal such patterns in the use of nominal compounds drawn from the Old High German adaptations of Latin school texts by Notker Labeo. Methodologically this study combines the morphosemantic analysis of nominal compounds with a hermeneutic approach interpreting compounds in their textual and cultural context. Two significant patterns in the use of nominal compounds were established: Firstly, the pattern of explanatory translation where nominal compounds as complex linguistic expressions provide an extra of information in comparison with the Latin original. Secondly the pattern of summarizing translation where binary compounds translate more complexly structured Latin expression. Jordan, Mark/Halton, Thomas P./Matter, E. Ann/Sperberg-McQueen, Michael (Hg. ): Patrologia Latina Database. Electronic version of the first edition of Jacques-Paul Migne’s Patrologia Latina (1844–1865). 1996–2018. http://pld.chadwyck.co.uk/ (8.10.2018).